Sign up for Broadjam today to follow BlaKats, and be notified when they upload new stuff or update their news! 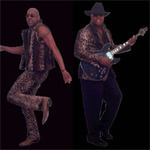 BlaKats, featuring Hollywood the veteran front-man, singer-songwriter, entertainer extraordinaire, and guitarist G-funk. G-funk produces the music, and Hollywood pours his heart and soul into it with silky, sensual vocals. Master Keyboardist Rollins Ross, and Drum beat master Donald Poole are featured on the tracks.